Certified in occupational therapy, Julia Kaoru Murray dedicated her whole career to kids with learning disabilities like autism and ADHD. Although she retired in 2010, she is still remembered throughout her community for her connection to her students, who credit her with being the only teacher with whom they could be themselves in class. They appreciated that they didn’t have to restrict themselves with her, as they did in other classes. Ms. Murray’s journey initially began when she was in 6th grade. She received a pamphlet promoting new and interesting professions, and, was drawn to occupational therapy. Although less than 20 colleges offered it at the time, she persevered, and graduated with a Bachelor of Arts from the University of Hawaii in 1956 and a certificate in occupational therapy from the University of Puget Sound in 1958. Degrees in hand, Ms. Murray set out to achieve her goals. 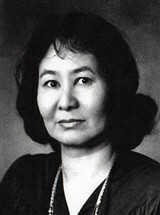 In 1958, she obtained a position as a therapist with the Institute of Logopedics in Kansas, and in 1959, she became a senior therapist at Hawaii State Hospital. She continued to advance rapidly through the field, serving as a part-time therapist at the Centre County Center for Crippled Children and Adults at the State College in Pennsylvania, vice chairman of the advisory board of the hospital improvement program for East Oregon State Hospital, the vice president of Independent Living, Inc., and a member of the Oregon Board of Engineering Examiners. Other positions include supervisor and occupational therapist at the Fairview Training Center, and occupational therapist for the Okinawa, Yokota A.B. Division, and Misawa A.B. Division of the U.S. Naval Hospital in Japan. For her efforts, she was awarded a Decorated Meritorious Civilian Service Medal from the U.S. Navy. When Ms. Murray wasn’t working, she was very active in her communities. She was a representative from the Umatilla County Commissioners to the Blue Mountain Economic Development Council, a member of the Ashland Park and Recreation Board and the executive board of the Liberty-Boone Neighborhood Association, and the vice chairman of the advisory board of LINC. Further, she was a member of the American Occupational Therapy Association, the Oregon Occupational Therapy Association, the Hawaii Occupational Therapy Association, and the League of Women Voters. In retirement, Ms. Murray enjoys reading and spending time with her children, Michael Joseph Murray, Susan Kei Mallal, and Leslie Ellen Heath, as well as her son-in-law, Bradley Heath. Another favorite pastime is chigiri-e, a Japanese art form through which she creates portraits, cards, and decoration pieces. Looking to the future, Ms. Murray intends to write a book, “The Whale is Surfing in French Fries,” inspired by one of her students.